Say goodbye to unflattering clothes that make you feel and look frumpy. The modern range of maternity clothes is gorgeous and stylish. Expectant mothers should feel special and beautiful. After all, pregnancy is a special time in life, and your choice of clothing should not change that. 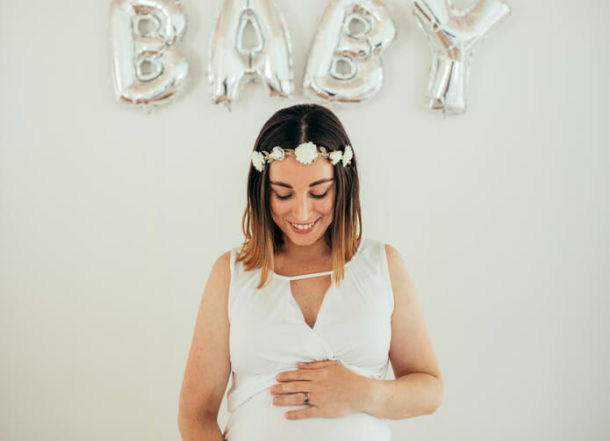 Whether it be business attire, formal outfits, sports fashion or just something comfortable to wear every day, the range of maternity clothes available today can look as good as it feels. What’s more, you can stay true to your style and you don’t have to spend a fortune doing it. At Zalando Lounge, you can find flowing blouses, draped skirts, wrap dresses and stretchy maxi dresses that all accommodate a growing belly. At the moment, onesies, jumpsuits, leggings, and stretchy jeggings are in fashion and all styles that are great for soon-to-be mums. A maternity range of shorts and trousers are available, which includes stretch panels and elastic waists. Make sure to invest in some great coats, blazers and jackets that are longer and might wrap around your belly. These are the kinds of versatile items you can wear to a meeting or running to the supermarket, while still looking and feeling chic and smart. What about that faithful pair of jeans that you always wear? That particular pair might need to take a rest for a few months but don’t worry, there are plenty of options. Jeans with over-the-bump panels, stretch panels and elastic sides are comfy and will stay up throughout the growing months. It’s all about flexibility. Maternity clothes need to adapt to your changing body. Following that rule, it’s possible that even high-rise skinny jeans with elastic fabric might do the job. Just look out for what you need in terms of sizes – petite, tall or plus. Maternity clothes offer some amazing considerate features. There are built-in belly bands that support the lower back and abdomen during pregnancy. There are also tops, tanks and pyjamas with built-in bras for extra support. Soft waistbands, compression and non-compression hosiery make for extra comfort. And while you’re at it, you might want to invest in a few nursing tops, which have a panel that lifts for easy nursing. You’ll be grateful for these during your first months of pregnancy. One of the best parts about the range of maternity clothes that are in fashion today is the fact that they are not trying to hide your baby bump. Instead, if you want to flaunt your pregnancy, you can. Garments that cling to your new curves, and even emphasise your belly and bust, are now the norm. In fact, the larger and rounder the belly is looking, the better. Supermodel Miranda Kerr made that clear when she stood on the red carpet (actually, in this case, it was black) at the Warner Bros. Post-Golden Globes Party. A halterneck gown that cinched in above the waist and hugged her belly tight, emphasised her pregnant body to maximum effect. Angelina Jolie’s flowing emerald green gown on the red carpet at the Cannes Film Festival was the same. We’ve sure come a long way from the days of hiding the pregnancy from sight. So don’t dread a period of pregnancy, welcome it. And do it with style. Not only is it possible to remain beautiful and fashionable during pregnancy, you can do so at an affordable price. Zalando Lounge is an online shopping club that offers members incredible deals and discounts. Every day, exclusive sales and promotions pop up, offering the best in quality and fashion, including maternity ranges. So pick up a deal and flaunt that baby bump.